Today, thanks to wireless technology and innovative thinking, busy families and their designers are discovering new possibilities when it comes to designing homes. A dramatic transformation is underway. 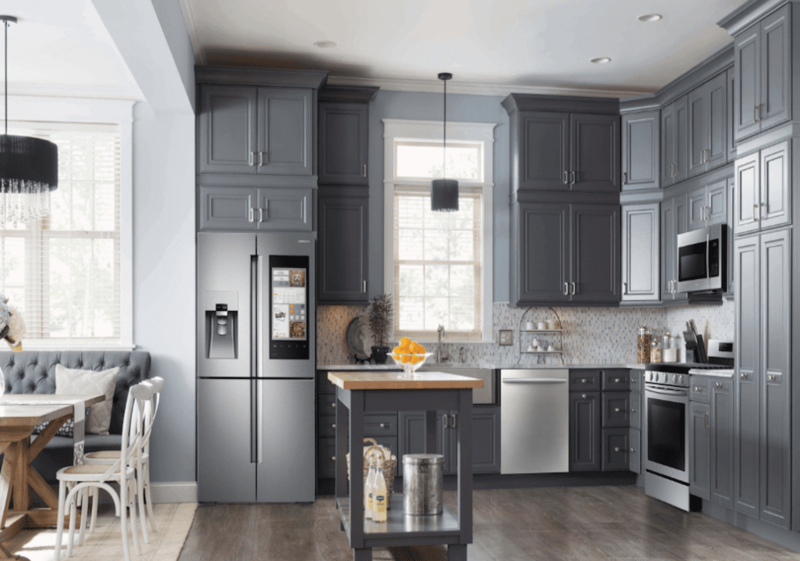 Everything from the latest kitchen appliances to home entertainment options provide seemingly endless possibilities for Canadians as part of today’s connected home. Be it large or small, the kitchen has always been the gathering place for family activities. Many of us spend our time at home in the kitchen; after all, that’s where meals are created, where conversations happen and where people spend much of their time together. The kitchen is the hub where today’s connected appliances can make things more family-friendly and convenient. With the Samsung Family Hub refrigerator, you can shop for food, organize your family’s schedules, post photos, keep up with favourite TV shows while you cook and even see who is at your front door while watching the stove. How cool! The Samsung QLED TV and The Frame are a designer’s dream. The QLED TV combines innovative colour picture performance with ground-breaking Quantum Dot technology for exceptional purity and brightness levels. Its unique technology delivers an incredible picture across a wide variety of lighting environments so you can experience bold contrast, night and day. The TV also blends into any space by harmonizing with the wall colour or pattern that it’s mounted on using Ambient Mode. This feature also allows you to display decorative content, personal photos or even the current weather in a clean, minimalist way. Plus, distractions like messy cables and the black space on the wall are hidden. The Frame, which can be mounted like a painting or a photo on the wall, also hides the cords and intelligently adjusts to surrounding light so your connected content—family photos or a piece of art from the specially curated Samsung Collection or Art Store1—appear like a painting rather than a screen. With interchangeable mattes, bezel frame colours2 and display options, you’ll have fun changing the ambiance of your room with a touch of a button. And, adaptive display intelligence (ADI) can also switch the TV off when you leave the room and turn it back on once you return. Clever! Remote access? The recent news on large-capacity washer-dryer combos is that they’re IoT enabled and Wi-Fi connected. The Samsung FlexSystem laundry pair is “smart” enough to deliver alerts, as well as to stop, start and monitor every cycle remotely via the Smart Home App3. Washing time can also be reduced by up to 50%4 with the simultaneous wash and dry feature that allows for washing two different types of laundry at the same time. That’s progress! As the future of connectivity takes shape, experts suggest we’ll see even more rapid change in our capability to communicate within our homes. So, expect more, take a holistic approach to design and functionality of network connected appliances and look forward to more exciting innovations from manufacturers who inspire you. This content is sponsored by Samsung Electronics Canada. Samsung is inspiring Canadians to reach their full potential through a transformative ecosystem of products and services that deliver innovation and distinct design to every aspect of their connected lives. Bring your ideas to life. Keep up with the latest trends in home technology and check out special programs for interior designers and decorators at designercommunity.ca. 1. The Art Store may not be available in some countries. Art pieces in the Art Store are subject to change without prior notice. 2. Each customizable frame sold separately. 3. The Samsung Smart Home app supports Android OS 4.0 (ICS) or later which is optimized for Samsung smartphones (Galaxy S and Galaxy Note series). This app also supports iOS 7 or later models. Smart Home App available in App Store and Play Store. 4. A normal one-hour wash can now be completed in 30 minutes compared to a Samsung WF511 washer without SuperSpeed.